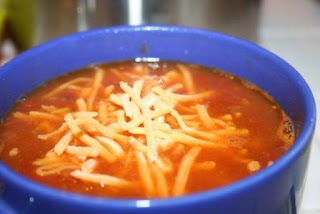 I recently promised to post my taco soup recipe, as it’s one of my favorites that often makes its way into our weekly meal plans. This is one of those “dump it in” recipes that basically just needs to be heated up, but gets better if it slow cooks for a while. I got the recipe (which I’ve altered, as I tend to do), when I organized a teachers’ luncheon at my son’s school. We had 10 moms volunteer to each make a crock-pot full of this soup. Others donated the chips, cheese and desserts, and no one had a huge day of cooking to do for the luncheon. The teachers loved it. Two cans pinto or “chili” beans. I prefer the Ranch Style brand beans. One can Ro-tel (tomatoes and green chilis). Two 14 oz cans of whole tomatoes. (Or one big can, whichever is cheaper.) 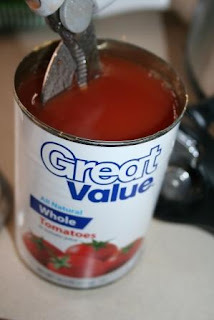 I use kitchen scissors to cut up the tomatoes while they’re still in the can. Logic would say that it would save time to just buy diced tomatoes, but I’ve tried that and the diced ones make the liquid more of a sauce, while the juice that the whole ones are in is better for soup. Water. I like to put two 14 oz. cans worth of water in mine, because I like it soupy. Some recipes I’ve seen say to just put about 1/4 cup of water in, and it turns out more like chili. 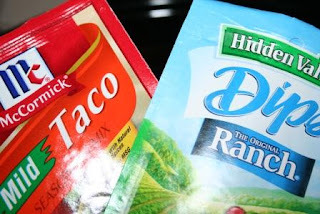 A pouch of taco seasoning, and a pouch of dry ranch seasoning. Just tear them open and dump the dry mixes into the soup. You don’t need to read or follow any directions on the pouches themselves. Somehow those seasonings together are fabulous. Serve with tortilla chips or Fritos, and grated cheese. Some people also like to mix in chopped onions and sour cream. A perfect, hearty, cold-weather soup that is even better for lunch the next day. I’m linking this up over at Smockity Frocks (one of my favorite blogs) where people are sharing their favorite cold-weather lunches. I believe this counts since I’ve eaten it every day that I’ve been home for this cold, cold week. Read Newer Post What if the Bug Man reads my blog? I made a similar recipe on Monday when we were snowed/iced in. Paired with some homemade cornbread, it is the perfect cold weather meal, especially when I only had to come out from under my blanket for about 5 minutes to put it in the crockpot. Wonderful! So simple, yet sounds so yummy! And who would've thought to add ranch seasoning? 🙂 I'm bookmarking this one and trying it out next week, if I can wait that long. Ironically, tacos are on the menu tonight. I know I could make this instead, but, I don't have all of the ingredients. And we are currently snowed in. I have a recipe very similar to this. I use white corn instead of yellow, and it calls for a can of green chilis instead of rotel. Mine calls for 3 cans of beans, black, pinto, and kidney. I love all the different beans. Mine is basically doubled as it calls for 2 lb meat, 2 packets each of seasoning, but the same amount of tomatoes, etc. Know what? If you make this the thicker way, it's an AWESOME DIP for hearty tortilla chips or crackers like at a party…obviously if you ate enough chips at home to make this a meal, you'd be in big trouble. I agree that this soup is perfect with some Jiffy cornbread muffins. Make the batter that morning, and your muffins will be super fluffy. This soup has ruined chili for me. I eat chili and I miss the ranch and taco flavors and the corn! becky, my recipe is like yours. 3 different beans and the corn. but mine calls for a large can of tomato sauce, which makes it more like a chili than a soup. we LOVE it! w/grated cheese and sour cream around here. I've never heard that about making the cornbread batter ahead so they'll be fluffier! What a great idea. I'm not generally a big fan of cornbread because of it's so dense. And that's my dinner! Thanks! well, I remember reading in my Betty Crocker that if you let muffin batter sit, the tops will be higher. So I noticed that when I make my muffin batter first so it sits for a little while in the muffin cups, the tops are like cones rather than flat rounds. I also stir the box mix as little as possible. all that said, I don't think they're any less dense, if that's your beef with cornbread. At my house, cornbread is an excuse to use copious amounts of cinnamon honey butter outside of dessert!!! That sounds yummy. And I could easily use veggie crumbles instead of beef. I think I'll make this on Sunday. Thanks for sharing. I am making this today. YAY! It smells AMAZING. This winter my goal was to learn to make soup – I can make leftover potroast stew, chili, and potato soup. I’m just going to have to try this recipe!!! I bet it would be great with shredded crockpot chicken too.